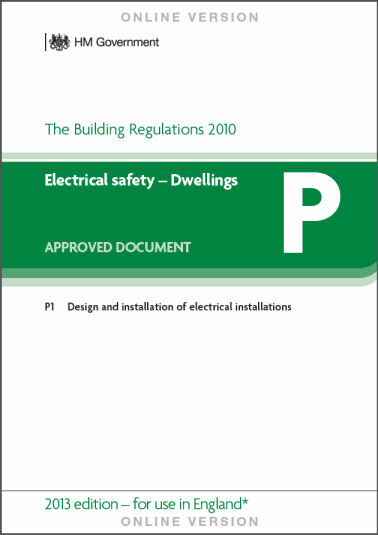 Building Regulations and "Part P"
Since 2005, it has been a requirement that domestic electrical installations in England and Wales comply with "Part P" of the building regulations (there are similar regulations for Scotland). These rules are designed to ensure the safety of people and property, and prevent individuals who are not suitably qualified or experienced from carrying out electrical work. All new installations, plus any additions or alterations, must comply with these Part P rules, and a lot of electrical work nowadays needs to be notified to the local building authority. Work that needs to be notified includes additions or alterations in a bathroom, replacement of a fuse board or consumer unit, and installation of a new circuit in any location. This notification must be done before work is started. Members of a competent persons scheme are exempt from notifying the building authority beforehand, and instead notify after completion of the work via their competent scheme. There are three commonly-used schemes in England and Wales – NICEIC, ELECSA and NAPIT – and an annual assessment of competence, together with holding relevant qualifications and liability insurance, is required to be a member of any of these schemes. Croft Electric is a member of the ELECSA scheme. As well as complying with the electrical regulations, electrical work must comply with other aspects of the building regulations. For example, Part A (Structure) has restrictions about holes and notches in joists, and chases in walls – to prevent significant weakening of the building structure. Part B (Fire Safety) has requirements about siting of smoke and heat detectors for fire alarms as well as precautions to prevent the spread of fire. And so on (there are a total of 14 parts, some more relevant to electrical work than others). For all domestic work, you should make sure whoever is carrying out the work is registered with one of the Part P competent persons schemes, and is able to complete any necessary notification, otherwise you may run into difficulties later, for example when selling your property and the buyer asks for the documents. The extra cost of doing the work properly in the first place is generally quite minimal, while the cost later of putting right a botched job that doesn't meet regulations can be high. The worst case is where unsafe work puts you or your property in danger – for example, a consumer unit that is in danger of overheating and catching fire. The current version of Part P of the building regulations, effective April 2013, can be found on the UK Government's Planning Portal site. Note that an older version is still in use for Wales. If you want to know any more about any aspect of Part P and the building regulations, please ask. Croft Electric Ltd is a member of the ELECSA Competent Person Scheme, and is listed on the register. There is a common perception that businesses and other organisations must carry out annual Portable Appliance Testing (PAT). What the law actually says is that electrical equipment must be maintained, to prevent danger, so far as is reasonably practicable – and this requirement could be met in some other way – for example, by performing regular maintenance. However, the simplest and most cost-effective option to meet this obligation is to have the equipment tested on a regular basis – PAT Tested – by someone competent to do so. Any business dealing with the public is required to have its electrical equipment maintained. Also included are schools, libraries, clinics, restaurants, bars, hospitals, and small businesses such as landlords, mobile hairdressers, photographers etc. PAT testing comprises visual checks – on the appliance, cord and plugs – and in-service tests – earth continuity, insulation resistance and functional checks. The exact tests depend on the nature of the appliance. Mains extension leads and adapters should also be tested. For equipment used by the public, a testing interval of 12 months is typically recommended, but some types of equipment should be inspected and tested more often – for example some portable and handheld equipment should be tested every 6 months, depending on where it is used. In some cases, inspection and testing can be done less often – for example IT equipment in some locations. If you need PAT Testing, Croft Electric can advise on this – what needs to be tested and how often. A common question when rewiring, or adding new sockets or lights, is do we need to access under the floorboards or in the loft, and if so, how easy is this. To answer this, we first need to know how the house has been wired. The wiring for the upstairs lighting is usually in the loft space, with cable drops in the wall down to each switch, and any wall lights. The wiring for the downstairs lighting is typically in the space (void) between the two floors, again with cable drops in the wall to switches and any wall lights. The wiring for all the sockets – both downstairs and upstairs – is typically in the void between the two floors. The cables drop down to the downstairs socket outlets, and rise up to the upstairs socket outlets. For an older property with floorboards downstairs, and a void underneath, the downstairs sockets will likely be wired under these floorboards, with cables rising to each socket outlet. Access to cables in the loft is easiest if it is not boarded, but boarding can often readily be lifted and replaced. However, lots of junk stored in the loft can make the job a lot harder, if it has to be moved around. Access to the void between the floors depends on the floor covering and the type of floorboards. Carpet is usually easily lifted to gain access. An older house will normally have old-fashioned floor boards, and often these have already been lifted in places for previous work – for example if central heating has been installed, or previous rewiring. In this case, they can be easily lifted again, and replaced afterwards, together with any carpet. A more modern house will more likely have large sections of chipboard flooring and these sections may extend under partition walls. Unless sections have previously been lifted, it is often quite difficult or impossible to lift a whole section. 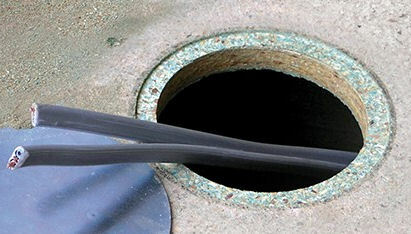 Instead, access can be gained by cutting one or more 4 inch circular holes, which are sealed afterwards with a metal plate that sits flush with the top of the board. Laminate flooring is not easily lifted, and in this case, it might be necessary to gain access via the ceiling below. A circular hole can also be cut in the plasterboard, and the plaster plug replaced in position afterwards, with the cut skimmed over. This works well for a smooth ceiling, but less so for artex-type finishes. When rewiring a house, the old cables can often be used to pull in new cable, minimising the underfloor access required. With careful use of cable rods, new wiring can sometimes also be pulled through with minimal access. If all else fails, surface wiring can be used. This can be hidden in mini-trunking that is screwed or stuck to the wall. While often acceptable in a utility room, or in out-of sight places such as a cupboard or storage area, it doesn't generally look the best in a nicely decorated room.